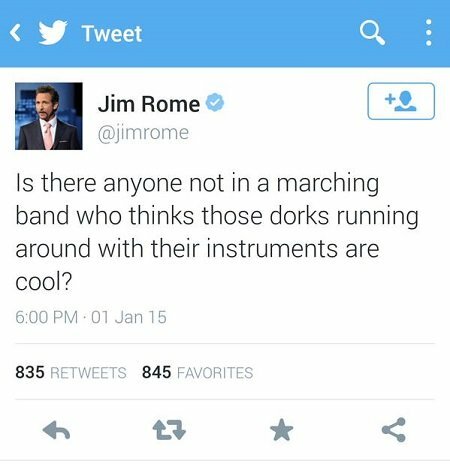 It seems like every band “dork”, including this one, is bashing Jim Rome for his idiotic tweet on New Year’s Day. In case you missed it, here is what he had to say. Let me begin by saying that I have never been a big fan of Jim Rome, and now I really don’t care if I ever hear from him again. He later deleted this tweet and posted an apology – only after the tons of negative comments from angry “dorks” everywhere. What a moron! I’m sure Mr. Rome has no idea the amount of commitment, hard work and dedication that goes into being in a marching band. I would like to see him try it. No doubt he would fail miserably, as he has done with his half-witted Twitter post. I was in the marching band. I have many friends who were fellow band dorks. My oldest daughter is in the marching band. Call us dorks if you will – we have thick skin and don’t take that as an insult. In fact, studies have proven that students who play musical instruments consistently score higher on tests like the ACT or SAT. They also generally have better grades than non-music students. Dorks? Who cares! Unless you have been exposed to the inner workings of the marching band world, you have no idea what you’re talking about. The hard work that goes into putting on a show is simply incredible. It ain’t for the weak! I have more I would like to say, but I’m choosing to stop. I prefer to let the music do the talking, so to speak. So, I’ll leave you with this. I’m no Ohio State fan, but their marching band is without a doubt one of the best in the nation. I’m honored to be among dorks! It’s Great To Be A Tennessee Vol!